It's funny how things get stuck in your head. Like the woman who gave me this notebook.She wasn't National Guard or CDC. The October Sixteenth Fund, maybe, or Remember Black River. The Remember People. All this woman had was notebooks. "We though some of you might want one," she said. "So you can record things about yourself or your family, or what's happened since the quarantine. That way if you get, you know, infected, it could be like your memory." Memory is Cardinal Cassidy's problem. When a strange illness hits the town of Black River Falls, the unknown virus wipes the memory of each infected person clean. They can remember some things--common knowledge like colors, numbers, song lyrics, how to read, but their personal identities, their families, their friends' names, the relationships they formed, all those are gone. But Card is not infected and it seems he is alone in remembering everything. Seeking out his old house, Card finds it abandoned. The National Guard rushes in to seal off the town to prevent spread of the virus to the rest of the country, and the government and private agencies provide supplies to support the infected, and slowly they begin to organize themselves into ad hoc arrangements. Strangers form couples, some take up life in abandoned houses, and children are sent to sometimes dangerous shelters where people, freed of old controls, prey upon them. Everything has changed. Overwhelmed by memories, Card meets up with his mother in the town. "Kid? Are you all right? You don't look all right." "I'm fine," I said. I sat up slowly. My mask was beside me, but something stopped me from putting it on. I'd spent three days after the outbreak searching for her. but this was the first time I'd actually seen her since that night. She was thinner, and her skin was deeper brown, as if she'd been spending a lot of time outside. I saw her wedding ring was gone. "Well, if you're sure you're okay..." she said, turning away. "My name's Cardinal, Cardinal Cassidy," I said. "Nice to meet you.Cardinal, but I'd better get going." she said. I called out to her again, but if she heard me, she didn't turn around. Then the protective National Guard is suddenly withdrawn, replaced by a subcontractor, Martinson Vine, the "Marvins," clad in black riot gear, masks, and heavily armed, who begin a forced roundup, loading the infected into transport trucks to re-settle them in "safe" places. Greer and Hannah refuse to be taken, hoping to keep their close group of kids together, but Greer is killed in the struggle, and Hannah chooses to stay with the others. In despair, Card feels hopelessly alone and isolated from all those he has come to care about. Being uninfected seems the worst of the bad choices facing him. In a moment of reckless wishing to forget, he removes his mask and kisses Hannah. But Card is immune to the virus, has been all along, and instead of forgetting, his memories are still there to taunt him with all that has been lost. Sometimes it seems that all the good things and all the bad things are like vines growing up the side of a house. They are so many of them and they're all so tangled that it's impossible to tell one from the other. It's easy to think you have been saved when really you've been doomed all along. "Would I be better off if I know?" 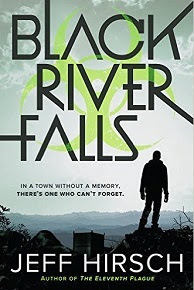 Jeff Hirsch's forthcoming psychological survival story, Black River Falls (Houghton Mifflin Harcourt, 2016), deals with more than survival after a strange epidemic. At its core this novel deals with the source of personal identity, hidden deep in the ying-yang of nature vs. nurture, innate personality or those memories that shape a child into the person he or she becomes, the question of where we exist, within our in-born selves or inside our roles in social milieu in which we live. Cardinal's uniqueness as a character lies at that choice point which few of us have as consciously as he. But growing to maturity is actually something like that, a kind of choosing what to keep from the past and what new life to pick to live, making this gripping internal coming-of-age story something of an outlier among the many dystopian science fiction novels out there. Although fans of super-hero comic sagas may be caught up in the complex parallel flashbacks to Card's father's graphic novel series, the Brotherhood of Wings, some readers may find they reinforce the theme that the outer world is something we create; others may merely see them as a dream-sequence metaphor to the otherwise fast-paced story. For the young adult reader, there is a lot to ponder in this novel of individual identity and community.